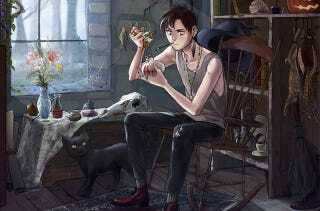 In a strange house filled with pieces of uncast spells, the witch's son is hard at work on a fresh bit of magic. You tell us: what is this young man's story? This illustration, "The Witch's Son," is by artist Lauren Nichols. As always, we invite you to write your own story inspired by this image and post it in the comments.